WestJet Airlines Ltd. tumbled after stepped-up competition and pricier oil snapped the carrier’s 52-quarter profit streak. 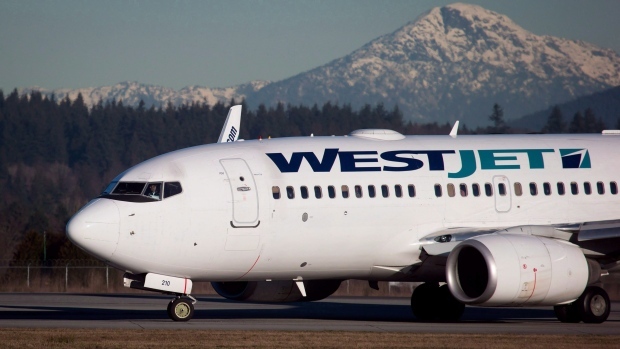 New discount airlines pressured fares in the second quarter while the cost of each liter of jet fuel rose 31 per cent, WestJet said in a statement Tuesday as it reported results. Canada’s No. 2 carrier also lost some bookings because of a threatened pilot strike. The company’s first loss in 13 years highlights the hurdles facing new Chief Executive Officer Ed Sims, who took over in March from Gregg Saretsky. With profits under pressure, WestJet said it would end some flights and curb the expected growth rate in seating capacity to no more than 6.5 per cent. That’s down from a previous forecast of as much as 8.5 per cent. “We are, of course, disappointed with these results and very focused on course correction,” Sims said on a conference call with analysts. The shares plunged 10 per cent to $17.95 at 10:11 a.m. in Toronto after sinking as much as 12 per cent for the biggest intraday decline since May 8. WestJet fell 24 per cent this year through Monday, the second-worst performance among Canadian industrial companies. WestJet swung to a loss of 18 Canadian cents a share in the second quarter, compared with the average analyst estimate of a loss of 27 cents. Revenue climbed 2.9 per cent to $1.09 billion. “The impact of the threat of industrial action, in combination with the dramatic increase in fuel price and competitive capacity provided particularly significant challenges in the second quarter,” Sims said in the statement. Revenue for each seat flown a mile, a measure of pricing power known as unit revenue, will decline 4 per cent to 6 per cent in the third quarter, WestJet said, citing industry capacity increases and “aggressive competitive pricing action.” Costs for each seat flown a mile, excluding fuel and employee profit share, will rise 3 per cent to 4 per cent in the period. Fuel prices that will be as much as 38 per cent higher than a year earlier will only add to the pressure. With jet fuel getting more expensive, the Calgary-based airline has embarked on a cost-cutting plan aimed at saving $200 million annually by 2020. For the year, costs for each seat flown a mile will rise 2 per cent to 3 per cent excluding fuel and profit sharing, WestJet said Tuesday. That’s down from a previous forecast calling for an increase of 2.5 per cent to 3.5 per cent.